We pulled into the Lupine Meadows Campground highly caffeinated and excited for our climb sometime around 12:40 am. 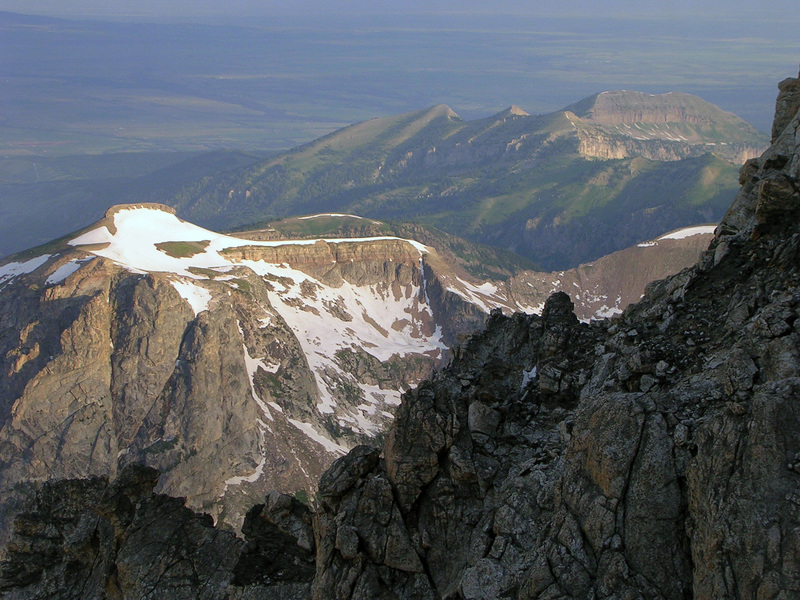 Joe Bullough and I had come on a tight itinerary to climb the Grand Teton via the Exum ridge car-to-car. This decision was made mostly for practical purposes (Joe had to take advantage of the bi-annual landscaping waste service that would be in his neighborhood Sunday), but also in the spirit of our recent habits of making EVERYTHING a ‘day hike’. We had hoped to get here earlier for a few hours of sleep, but unfortunately we had some problems leaving as early as we had hoped, so we were doing this climb with a sleep handicap. 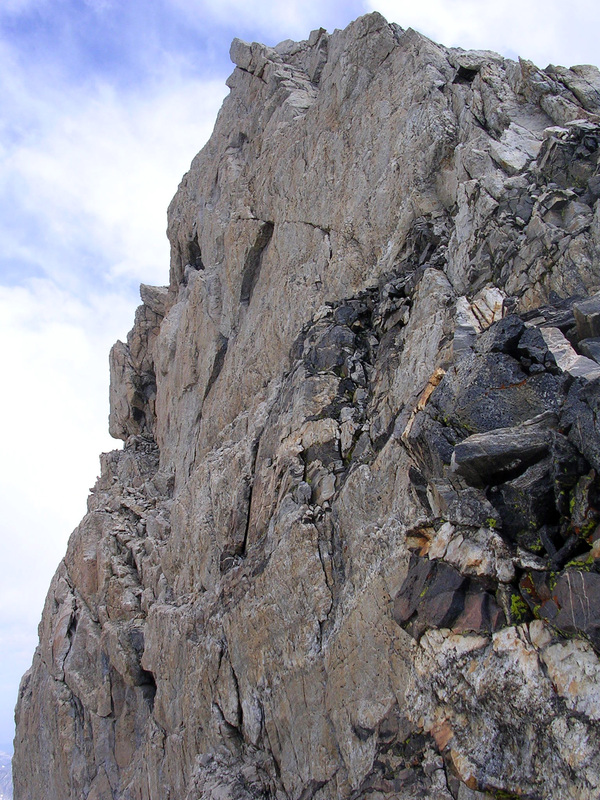 We followed the climber’s trail as it passed the black dike, and soon we were scrambling in class 3 terrain. 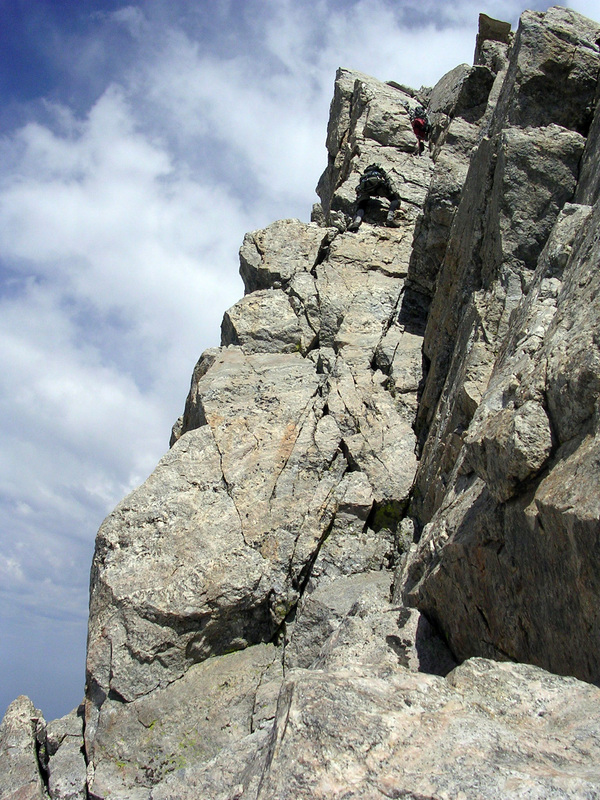 Our pursuers weren’t very fast scramblers, so we soon pulled ahead and caught one of the two groups ahead of us as their guide was belaying them up a crack beside The Needle. 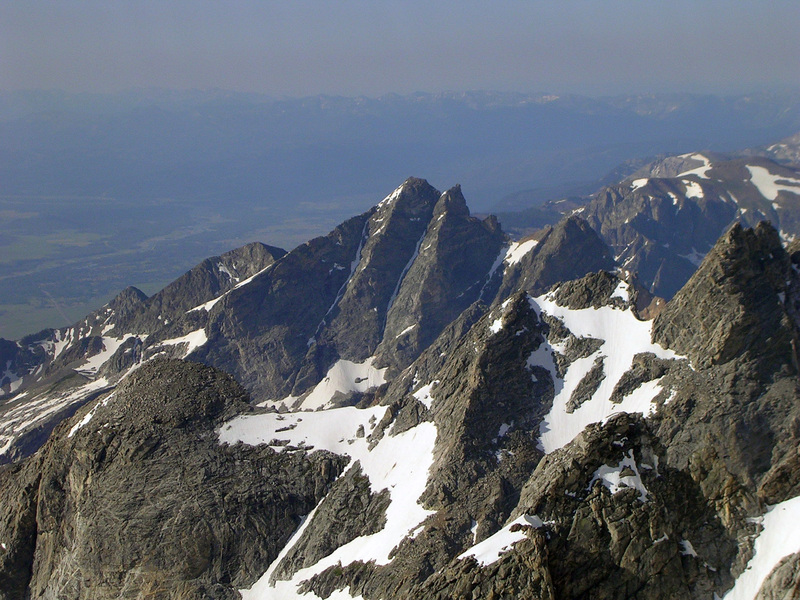 Middle Teton and its glacier seen from "The Needle" on our approach to Wall Street. 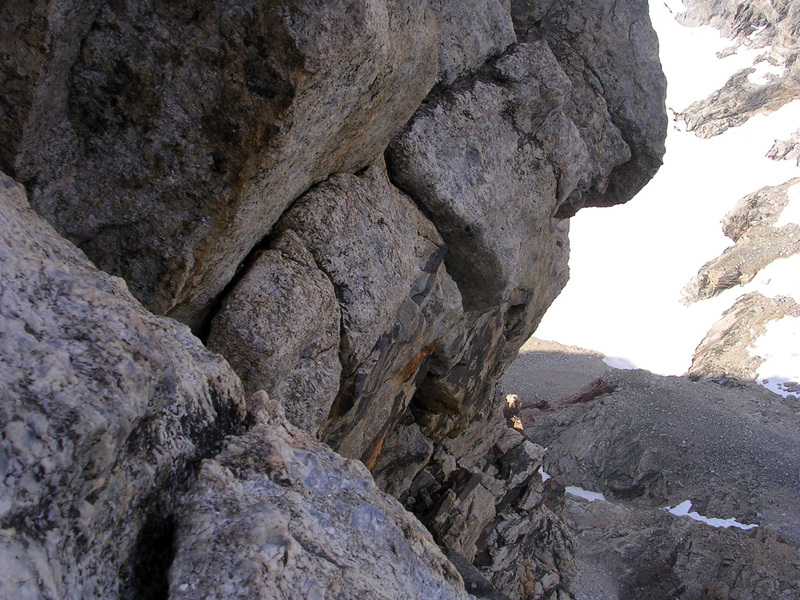 Joe scrambled across a slab to their right, and after exhausting other options I followed. From here we stayed near the rocky crest as we scrambled through class 3-4 terrain until we could find a break. The other group ahead of us had already reached the end of Wall Street, and we could see their small forms against the skyline of Exum Ridge. Wall street seen on the scramble approach. Nez Perce seen from near the start of Wall Street on the Grand Teton. Table Mountain seen from Wall Street on the Grand Teton. While I was getting ready to belay Joe on Wall Street, I saw some sea horses floating above me - was it a sign my sleep deprivation, or just an active imagination!? 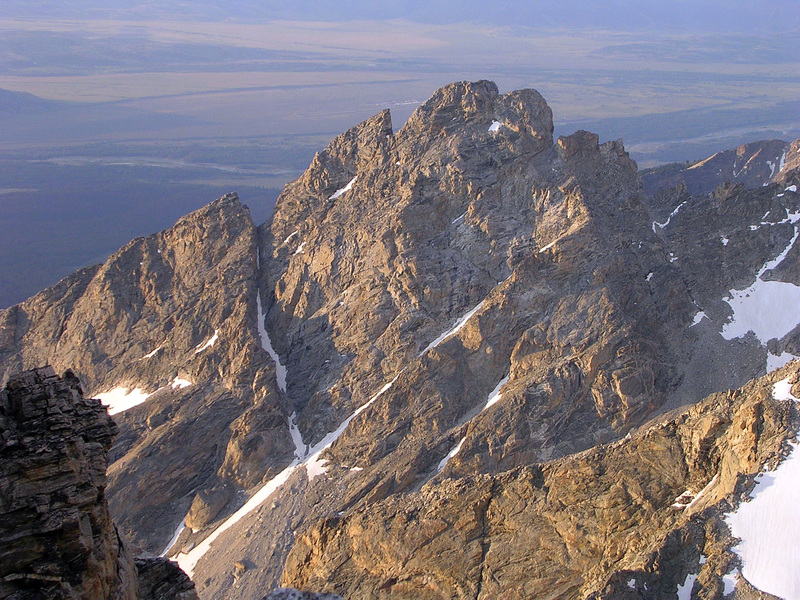 Buck Mountain seen from the base of the Golden Staircase on the Grand Teton's Exum Ridge. Ever wonder what it looks like below the Step-Around on Wall Street? Well, now you know! The rather mediocre pitch known as the Wind Tunnel. Its really just a set of bouldering problems, although the climbing was still fun! 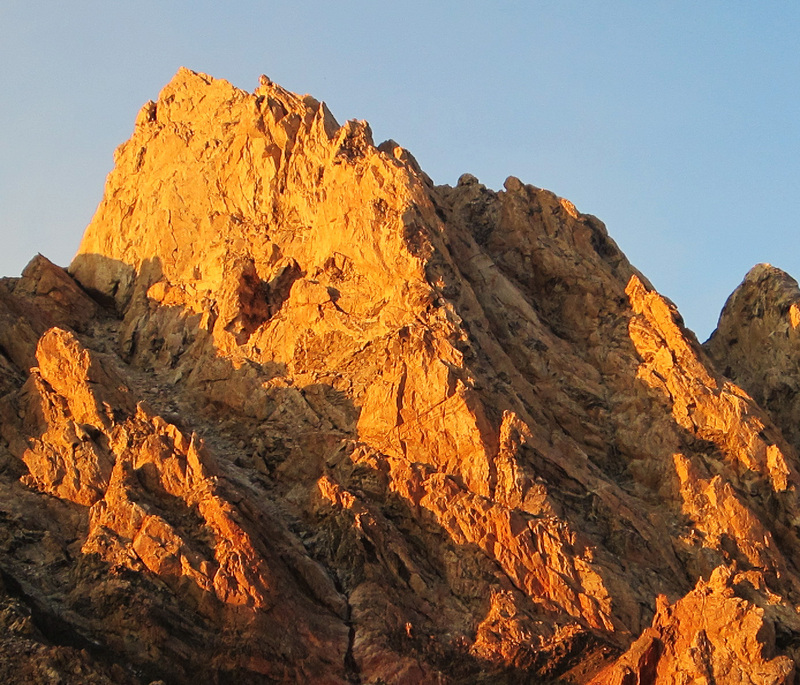 From the large ledge above the Golden Staircase, Joe and I free-climbed over to the boulder-filled chute to the right. Above the Wind Tunnel we coiled our ropes and free-soloed up to a notch to the right, and back around to the left to reach this spot. 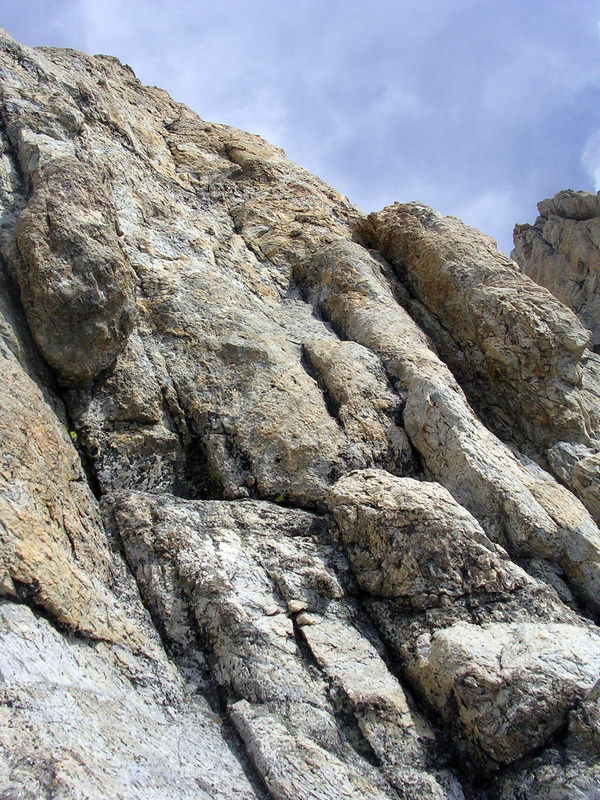 Climb up the cracks on the left for a fun full pitch to reach the small Boulder Ledge at the base of the Friction Pitch - the crux of the Upper Exum Ridge. 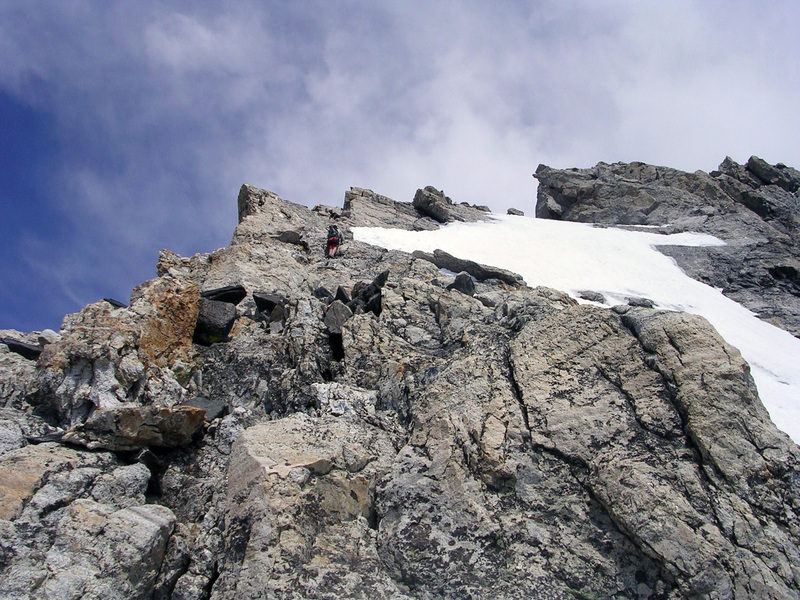 To avoid this pitch, you can also ascend the gulley to the right (often iced over, as it is in the photo), or ascend the chimney in the center corner (5.6-5.7). The Friction Pitch seen from Boulder Ledge. It was a little hard to follow the route description along here - but if you see rock like this, you're definitely on route! Climb up the groove to the right (takes a bit of pro), and double back left to two black knobs before launching up the pitch. My view down the Upper Exum Ridge as I neared the top of the Friction Pitch. 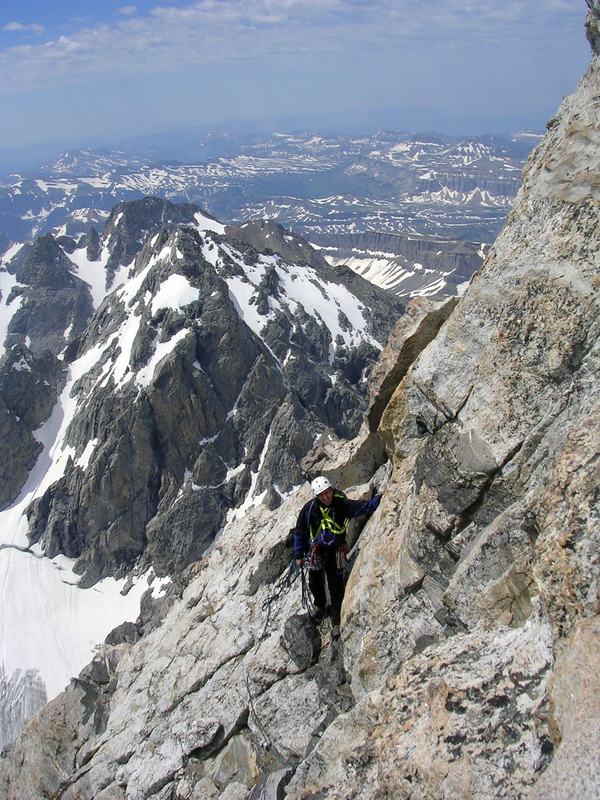 Joe Bullough at the top of the Friction Pitch on the Upper Exum Ridge. 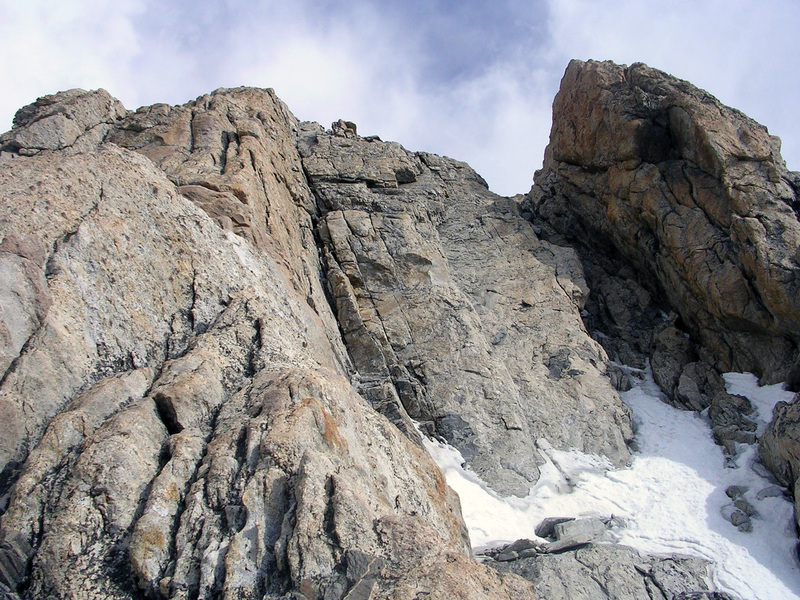 From the top of the Friction Pitch, we coiled our ropes again and free-soloed past an exposed notch (left), up a short headwall (right), and around the east side (right) of the ridge to reach the V-Pitch (aka. Open Book Pitch). 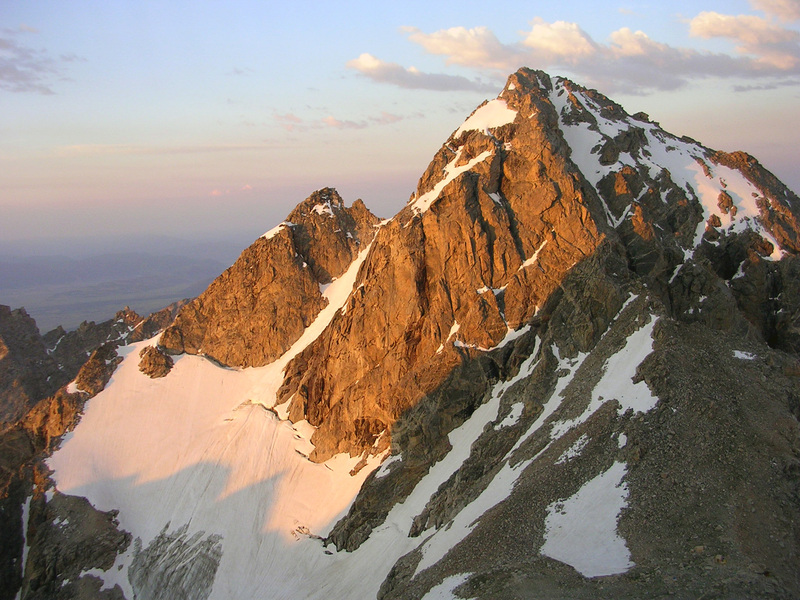 This pitch is the slanting dihedral illuminated by the sun in the upper left of the photo. Joe Bullough living the high life near the top of the Upper Exum Ridge. 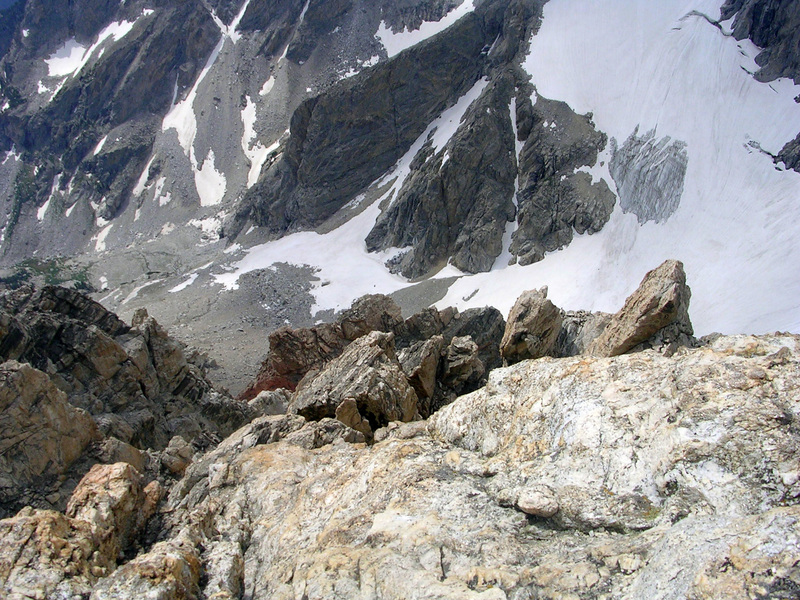 The huge monolith below is the large gendarme on the East Ridge, seen just past Beckey's Couloir. The round lake just to the left of this feature is Amphiteater Lake, a popular hiking destination that offers incredible views of the Grand Teton, and access to its northern face. To the left is Delta Lake, and to the right in the valley are Bradley Lake and Taggart Lake. Disappointment Peak is hidden behind the gendarme. Looking up at the V-Pitch from the notch above the Friction Pitch. 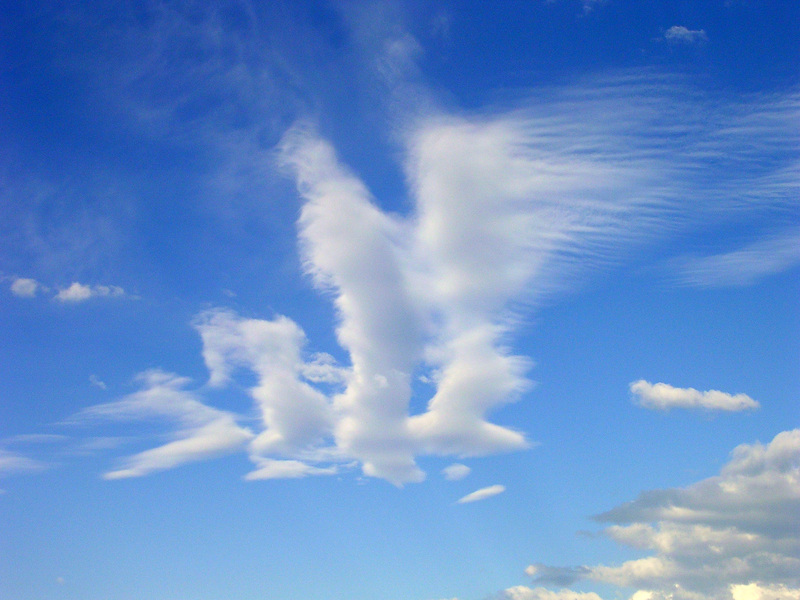 The "V" is the slanting dihedral in the top center of the photo. 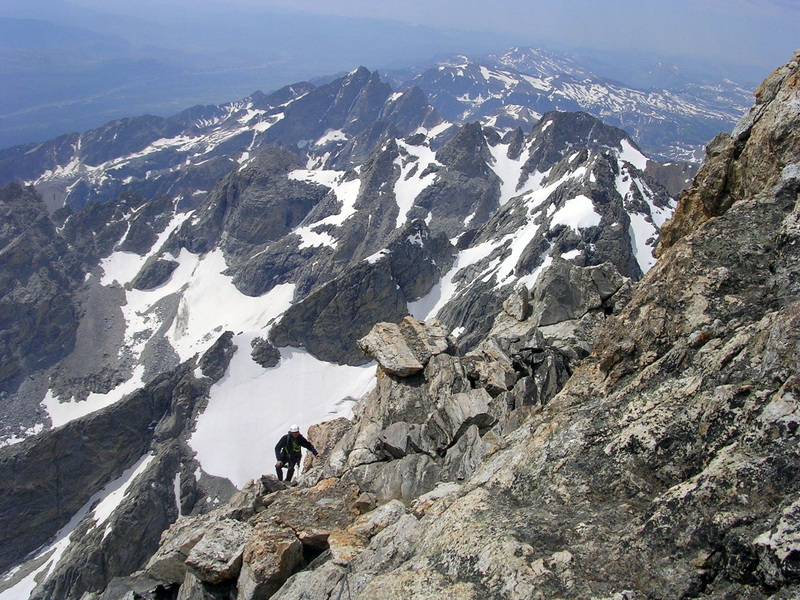 Nearing the V-Pitch on the Upper Exum Ridge. 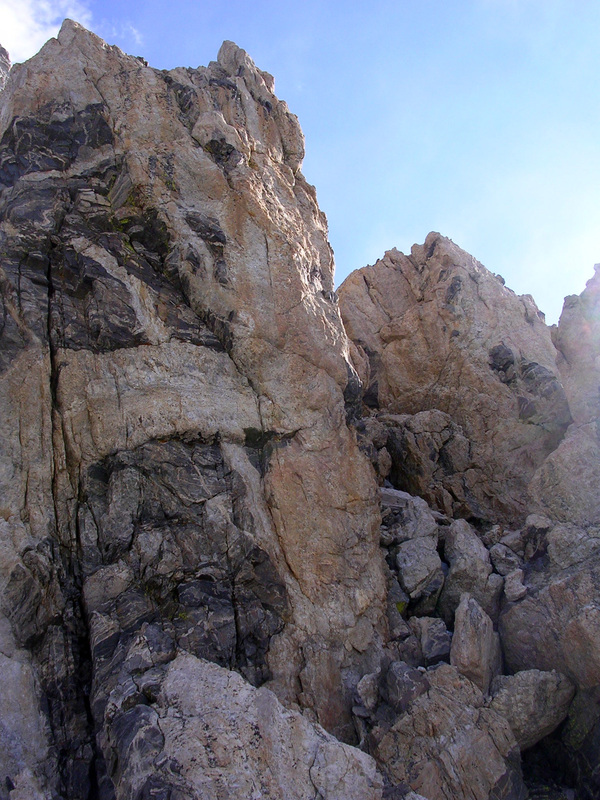 The climbing above the Friction Pitch was easy enough that we coiled the ropes and free-soloed here. 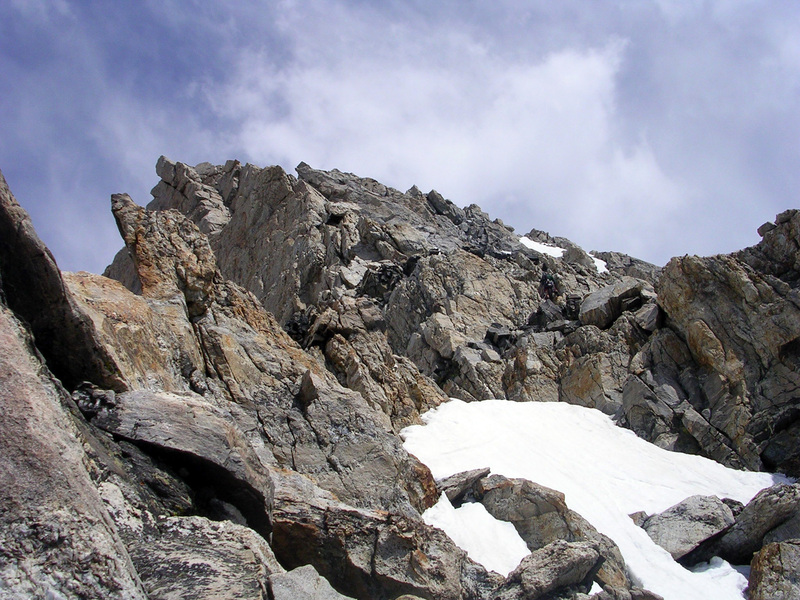 Some climbers who caught up to us on the Exum Ridge ascending the fun V-Pitch, the last roped pitch on the route before the summit block. 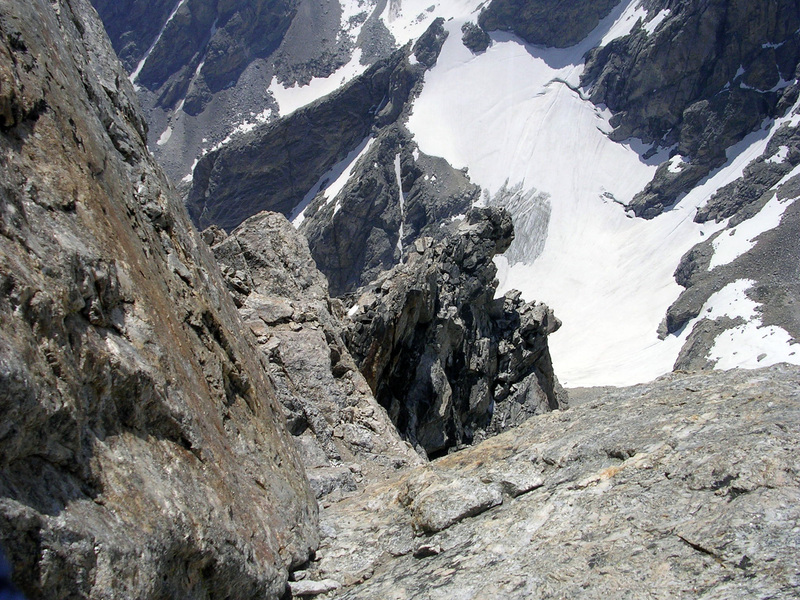 Looking down the fun V-Pitch of the Upper Exum Ridge. 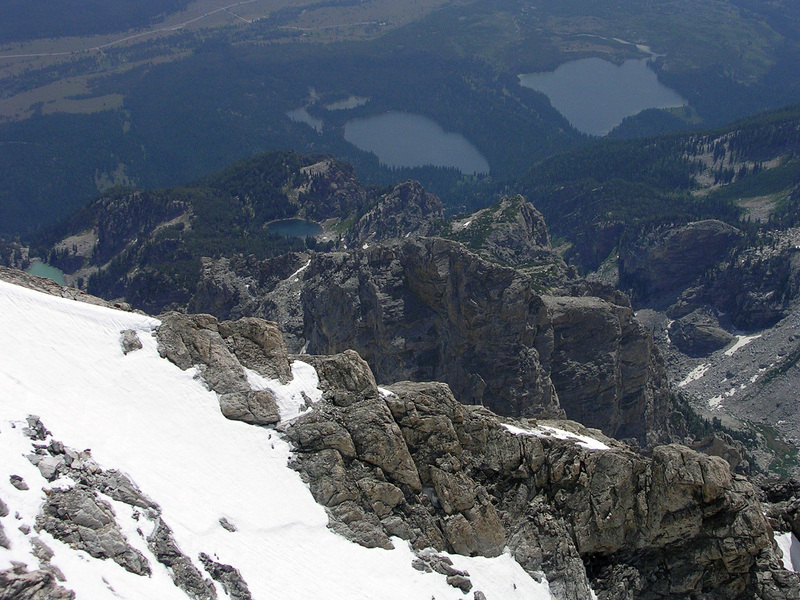 Far below is the Middle Teton Glacier. Above the V-Pitch we ran into trouble. 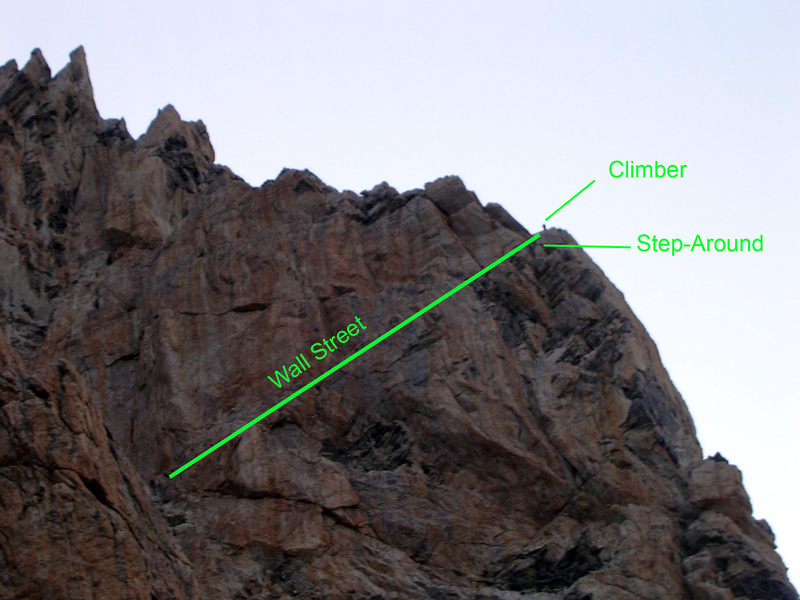 The guidebooks mentioned heading slightly west and ascending a left-leaning crack with an awkward lieback. The only cracks we could see looked much harder than 5.5. Perhaps if we walked up to them they wouldn’t have been so steep, but in our fatigue I guess the thought never occurred to us. At this point the wind was blowing hard enough that we decided to head straight for the rappel to the Upper Saddle unless we could quickly find a way to the summit – we were almost 2 hrs behind schedule, as it was about 1:40pm. The wind got even worse around the Black Dike. Dust, grit, and gravel blew into my face and ears. When the wind blew on one side of my head, the pressure differential really made my eardrums ache. The sustained gusts picked up and were so strong that I had to seriously squat, scrunch my abs, and drag my arms and legs forward to step down – it was like walking through a river. Then the wind would reverse direction and hurl me to the ground. My legs were constantly getting torqued, and because of my fatigue, the wind knocked me down a lot. In some cases I just stayed low until the gust let up. 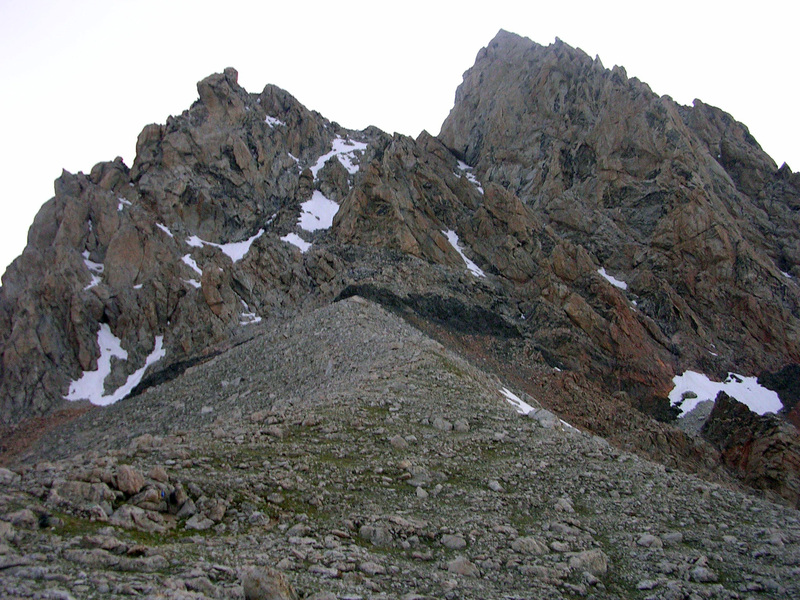 At several points the wind dragged me along the scree as I was standing, and I had to grab boulders to stop myself. When the wind was really bad, I had to squat down and grab boulders as I walked along to steady my torso.